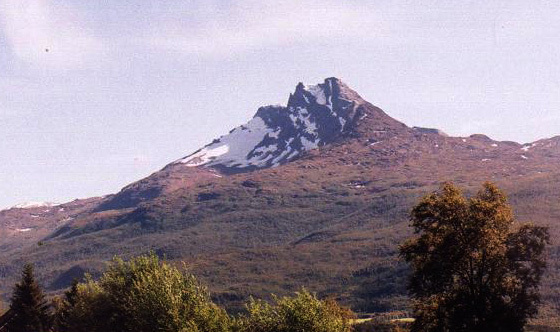 How to get there: This mountain is located near, but south of Narvik. Narvik is the city north in Nordland near the fjord where Norway has its smallest distance from sea to the Swedish border (less than 10 kilometer). Go south on Hwy. E-6 from Narvik. After passing Fagernes and Ankenes, you get to Håkvik. In the southern part of Håkvik, turn left on the road that heads up into Håkvikdalen. This road first climbs to the lake Silvatnet. Continue a short section further to the lake Nervatnet (221m). Immediately (actually before you see the lake) before you turn left onto a new bridge, there is parking for 3-4 cars on your right. This is the trailhead, elevation 223 meter, location N68:22.591, E017:22.702. Route description: From the trailhead, a small trail leads in among the trees and down to the lake. It immediately forks, the right branch serving a hut slightly uphill. Continue along the left fork as this trail follows the lake south to its south-west corner. Here, there is another hut and the trail climbs gently from the lake and passes this hut on the left side. The trail continues in the same general direction across a small creek that drains the meadow above. From here on, the trail is quite distinct as it climbs the hill among trees, then near a creek before gradually coming out above treeline in a small valley extending upwards. You now see the peak slightly left with the characteristic subpeak Litltind right in front. Here the trail forks, with the left fork going to the small, nearby lake Pappartuvvatnet. On many maps, the trail continues uphill on the west side of Litletind, however, the trail becomes hard to follow and this is not the best route. Take the left fork and continue towards the peak on the right side of the small Pappartuvvatnet lake. Follow a broad, gentle ridge as it heads higher into the basin. There is no trail here, but the terrain is easy. Looking ahead, the ridge from the peak runs down to a saddle before it climbs to the Litletind subpeak. Below the lowest point in this saddle, there are some sections of steep rock. However further to the left (nearer the main peak) you will see a slope climbing with no difficult sections. Looking closer at the horizon ridge, there is a small hump on it and the best route should ascend the slope in order to intersect the ridgeline immediately to the left of this hump. Ascend this slope, it is not as steep as it may look and the ground is easy with few rocks. As you get higher, you may naturally follow the terrain a bit to your right in order to find the best line to the small hump on the horizon ridge. In this way you gain the main ridge substantially higher than its lowest saddle and you are never close to any steep rock. After gaining the main ridge, continue uphill towards the peak gaining more elevation. Locate a quite distinct cairn seemingly quite far off to your right as you face uphill and do a gentle uphill traverse to this cairn. In case of poor visibility, this cairn is located at 1205 meter elevation with coordinates N68:20.927, E017:20.262. That is, do not continue uphill along the ridge above 1150 meter, but aim directly for this cairn. This cairn marks the beginning of the upper part of the trail. The trail is marked with more (smaller) cairns as well as some red paint (mainly arrows) on the rocks. The trail first continues an ascending traverse, then heads more uphill below the north-west summit (on the left) and the valley north of Kongsbakktinden (below on your right). There is a short section crossing some rather large boulders, otherwise the trail becomes quite well defined higher up as it approaches the saddle between the two summits. This broad and nice saddle has elevation 1530 meter and location N68:20.659, E017:21.108. 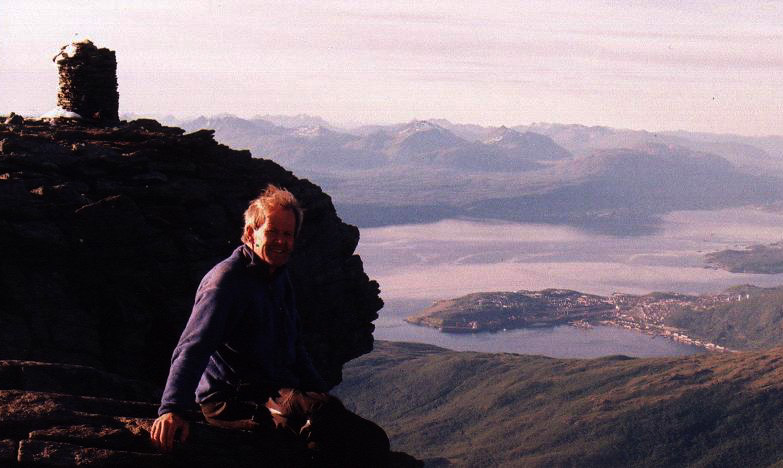 Hike up until you see Narvik below to the north. The main summit is 1575 meter to your right, that is the south-east summit. The marked trail continues very gently to a rather big summit plateau with a nicely built summit cairn. There is a summit register hidden in the cairn. 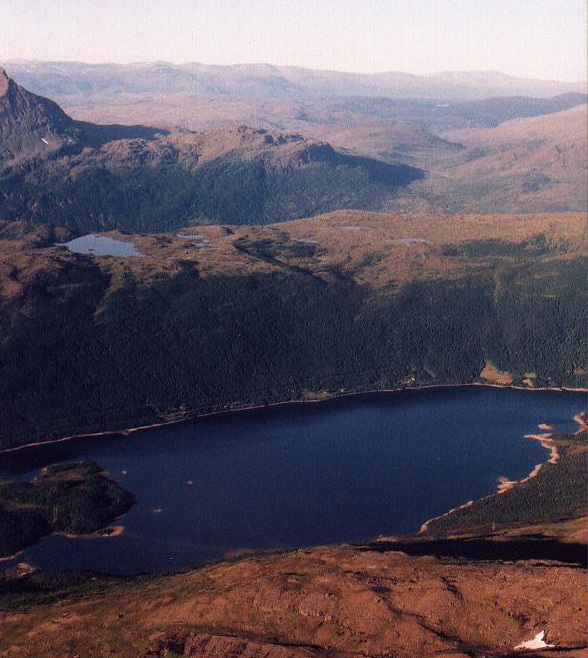 The first part of the route to this summit is YDS class 1 (to the small lake), then YDS class 2. In order to climb the lower, but more rocky north-west summit, descend back to the saddle then traverse on the left side (west) of the first part of the ridge. Steeper, broken rock is above you. Ascend up to a pretty obvious corner. From here two variations will get you up a short, steep section. Either go all the way into the corner and find a narrow ledge with overhanging rock that runs horizontally to your left. Crawl along this ledge until you emerge around a corner. This passage is somewhat narrow, but fine for people without a big backpack. Alternatively, climb directly to the same corner on good (large) steps of rock. This is the crux of the climb, scramble up on good rock to the summit ridge. The difficulty of this section is YDS class 3 (easy climbing). There are several cairns marking good viewpoints along the steep north side. The highest cairn is at elevation 1558 meter, location N68:20.713, E017:20.953. Comments: I did this hike with Edward Earl (Esquared). 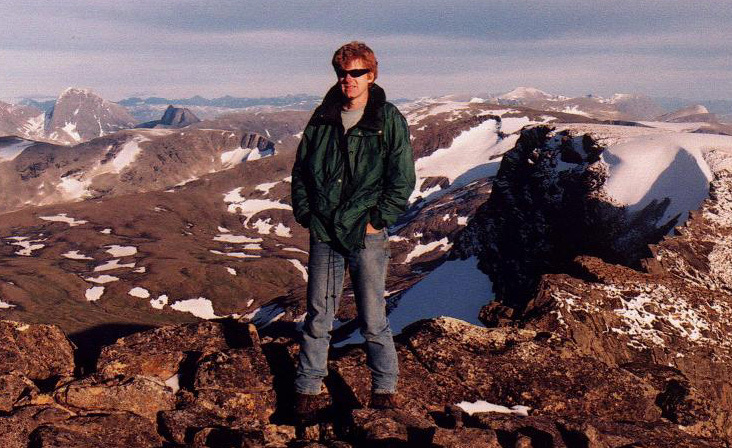 We had just made a pretty good attempt on Store Lenangstind, however without attaining the summit. Our next scheduled climb was Kebnekaise in Sweden. We had at least partially dried up in Nordkjosbotn the previous night and had now moved to Narvik "en route" to Kiruna. The weather cleared and only got better and better. Too bad to leave Norway without a single peak (especially for Edward). I suggested we try an evening hike of the Sovande Dronning (Sleeping Queen), a pretty famous local mountain. We started from the trailhead at 1600, made the West Summit at 1920, the East (main) summit at 1940. We took pictures and admired the good views for another 20 minutes. Departed at 2000, took the proper way directly down from the saddle to the lake (see the description above) and were back at the car at 2220. A very nice hike in good weather. We were now ready for a good night of sleep before the program of tomorrow: Drive to Kiruna, pick up Fora Chan at the airport and proceed to the mountain hut at the base of Kebnekaise. 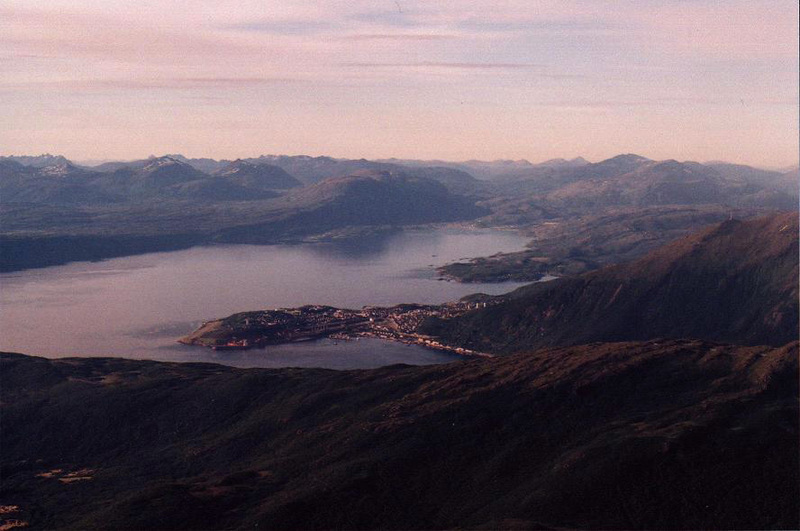 The mountain called "Sleeping Queen"
View of Narvik from the summit.